It has only been a week but the vanguard players like myself, are already enjoying the new avatars; especially the new cute lady Braids(mainly because it is easier to get than Mirri, lol!). Cute she is, but don't be fooled by the looks of her; she is a typical blue mage with full of trickery. And she cheats. She really does. First of all let's look at the avatar. Hmm... Three very useful abilities build into one avatar. Yummy! As I said, during the last week, many players were playing this new avatar and I saw many different deck types that were abusing this avatar's abilities. Many of them were only using the last ability of it; the creature part. People were putting into play Platinum Angel or Angel of Despair or Akroma, Angel of Wrath or even bigger creatures like Darksteel Colossus one after another and for a mere cost of 4! Ridiculous isn't it? Some other players were playing mono black discard decks. During early game they cast spells like Duress, Ravenous Rats and/or Stupor. And just when I expect something harmonious with the whole discard theme, guess what happens? They put into play Darksteel Colossus! My God! Was it all for that? I never was a Timmy and never ever will be and I never wanted to play Darksteel Colossus so I leave that Timmy part to... well... to Timmies. Let's get deeper a bit. First of all this deck is versatile. 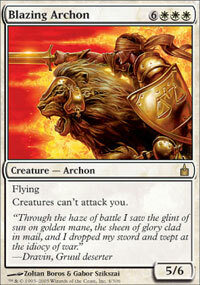 It has 2 ways of playing and this mainly depends on your opponent's deck/avatar/way of playing. If you are playing against a slow deck, don't even think of putting all those artifacts you have into play; you just play plain aggro. Bogardan Hellkite or Bringer of the Blue Dawn or even Grozoth(although it is not put into deck for aggro purposes) will do the job. In a few turns the game's over. Sometimes(actually almost always), before playing your tricks, you feel the (heavy) pressure of your opponent's creatures and this is when Kindle the Carnage becomes your saviour. There are really some crazy aggro decks out in the "jungle of vanguard" and you need to protect yourself from those savage predators! Normally, your first goal is to feel "safe". Darksteel Forge along with Mycosynth Lattice is the way to feel safe when playing this deck. If you have those two artifacts in front of you, it means that your permanents are untouchable. But of course not always you start the game with those two cards in hand, so you have to tutor for them. And this is the reason Grozoth is in the deck. It is your tutor card for your key cards. During some games, my opponent immediately conceded when I put into play Grozoth through my avatar and fetch 2 Bringer of the Blue Dawn, 1 Blazing Archon and 1 Darksteel Forge. Well, what can I say, he/she was going to lose anyway :). After you turn all permanents into artifacts(which happens much faster than you think) and make yours indestructible and sometime in between clear the board via Kindle the Carnage, nothing can stop you. This card is a joke. I mean it. During many games, I was able to cast it on turn 5(with a "little" help from Gilded Lotus) and the game was over that moment (and once I managed to cast it on turn 4). One last card I want to talk about is Smash. This long forgotten and totally useless-looking card turns into a Vindicate while each and every permanent on the board is an artifact! 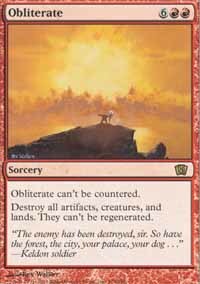 It is even better than Vindicate because it has the same converted mana cost but it is an instant and it allows you to draw a card! Okay, this is pretty much it. Of course this deck isn't perfect (as nothing is perfect) and there is always room for improvement. The one thing I think is to drop one Grozoth and add one Bringer of the Black Dawn. 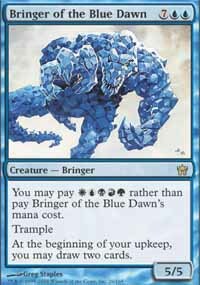 There were one or two games I lost because I needed a certain card (mostly Kindle the Carnage) and I just couldn't get it via the cards I was drawing with Bringer of the Blue Dawn and defeat was then inevitable. The ability of Bringer of the Black Dawn can help to avoid this situation although this help has a price. Or you can drop one Obliterate and add one Summoning Station. That was a card I added into the deck in earlier versions but cut it while perfecting the deck. I like focused decks and having 2x of this and that is not something I like. But I still think that one copy of Summoning Station wouldn't hurt. I don't have a sideboard. I didn't make this deck to play in a tourney or in the tourney room. But it turned out to be much more stronger than I first thought, I must admit that. But if you have a such idea, I can advise you one or two things. 1- There are REALLY extremely fast aggro decks out there. Pyroclasm, Starstorm or even Inflame could be a solution to this problem. Believe me, affinity in vanguard is as bad as it is in normal extended. 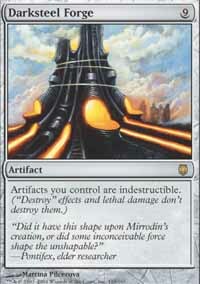 2- You may also want to drop the Urza lands to add black mana. This will slow down the deck for sure but in return you will have access to cards like Extirpate, Cabal Therapy, Persecute or Cranial Extraction. 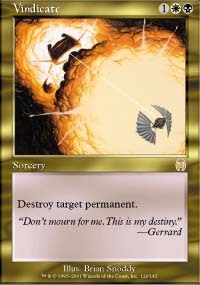 3- If you choose to add black mana into the deck, you can always replace Kindle the Carnage with Damnation. 4- Speaking of the mana base, you can keep the Cloudposts and add 4x Vesuva and then add 8x Swamp. Vesuva can copy your Cloudpost and this way you won't be missing the Urza lands that much. 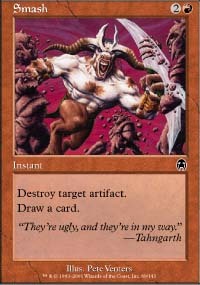 5- Also against "Graverobbers" you may want to add Tormod's Crypt into your sideboard. Okay folks. That's it for now. I hope you enjoyed the article and will enjoy this deck as much as I do. Use the card to get the Stations (Summoning, Blasting, etc.) out quickly. Of course, the avatar can probably do just as much. Haha! That makes so much more sense, a 9/9 and deckthinning. Sorry about the misunderstanding heh. Mitchy, I changed the avatar. hey man, nice article! welcome to puremtgo!... anyway can you try to fix your avatar and kill the whitespace from it? if you need help with it email me: mitch@Mitchellmatula.com, thanks! Thanks Mitchy, I'll try to fix it and if I can't, I will send an e-mail to you. Thanks Runeliger for the comments. I really do appreciate other player's thoughts especially when they help me build better decks! The only thing I want to make clear is that I'm not transmuting Grozoth, I'm putting it into play via my avatar and play its "comes into play" ability. You must be misunderstood that part. Thanks again. Thanks Sliver for your comments which are all correct by the way. Vanguard in extended is insanely fast, that is true and I warned the fellow readers about it in my article. Two avatars are real problem; a well piloted Nekrataal avatar and that Oni of Wild Places, which we also know from standard vanguard. Against those, my chances with the main deck are 40%-60%. With this deck I have played against Nekrataal 4 times and won 3 and lost 1, but this doesn't prove anything of course. The other I faced only once and lost. Sideboarding one or two drop mass burn spells(like pyroclasm) will help I guess. Against all other "casual room" decks/avatars, the deck performed very well; actually to be honest very very well. 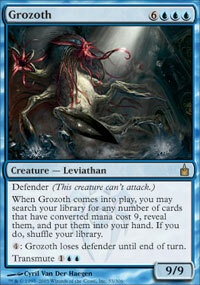 But I haven't faced any Dragonstorm decks, that I must tell, so no I'm not having any dreams of grandeur :). I love vanguard and am glad other people are playing it and even happier that people are writing about it. However vanguard tends to be fast... very fast or lock the game one way or another by abusing their avatars ablities or to accelerate already fast deck and thats just in std. In ext, although i haven't played much vanguard in ext (maybe out of fear of what i'll find or maybe because there are no events) I would imagine that there are some insanly fast decks and very broken combos and do not see how your deck could keep up with somthing like that. decks can kill in std by turn 4 and in vanguard its even faster. While it looks like a fun deck to play i simply can't see how it can keep up.